NHC was founded and started as an I.P.A. (Independent Practice Association) by 22 Medical Professionals based in Johannesburg. Created by Medical Professionals for Medical Professionals, the main aim of NHC was to empower the professionals at a time when reimbursement and managed care were challenging the medical professionals sustainability in South Africa. NHC’s main aim is Professional Empowerment, in other words, NHC must endeavor to put the Professionals in a position where they can be more stable as a group of individuals and earn more money by harnessing the scale of economics through strategies such as grouping up. This implies and requires a continual reassessment of the trading environment in order to optimise opportunities and create new services that may be required from time to time eg recruitment, group purchasing, electronic record storage etc. Strategic Investment in Olivedale Clinic. From a business perspective, the objective is to break even on N.H.C’s health care operations and to make a profit out of any other business that N.H.C may get involved in excluding anything related to health care. properties, leisure, retail etc. Such profits would then be used to continue to expand the health care business and empower more professionals by building more health centres. N.H.C. is the administration company and an extension of the medical professionals practice whether they are located within N.H.C Health Centres or in their own independent practice. 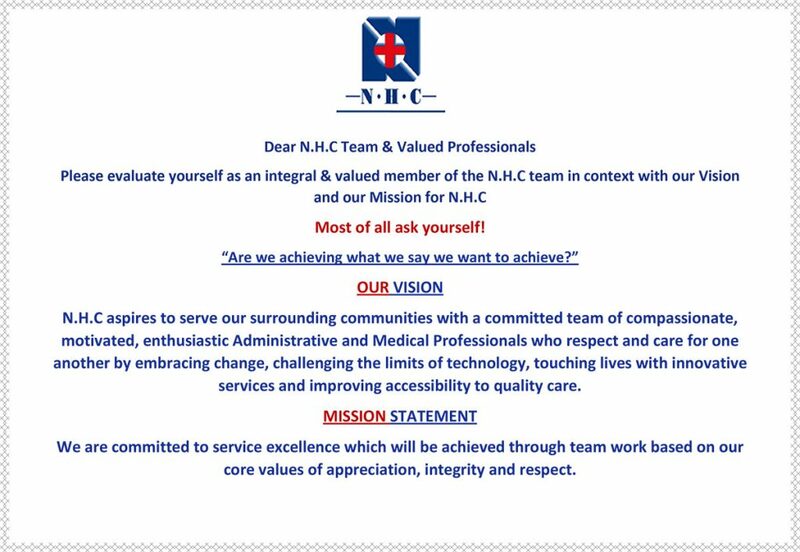 N.H.C’s responsibility is the repositioning of the medical administration business and the elevation of the professionals in the consumer or patients mind through the NHC brand hence the various radio adverts covering issues affecting the community. Committee decides that there is a need for a full time business manager and agrees with members to explore all options. Northcliff Day Clinic strategic investment completed. First N.H.C advert printed advertising the 89 medical professionals names in the local newspaper that made up the NHC Medical Professional Network. N.H.C begins assisting its medical members identify areas in their practices where theft and in-effiencies can be found. As members of the N.H.C the members receive assistance in practice administration restructuring to optimise debt and cash flow. Strategic investment in Wilgeheuwel Hospital with various specialists and Presmed Hospital Group. Southern Healthcare (JV between United Healthcare USA and Anglo American establishes itself in South Africa bringing American styled Managed Healthcare to our shores. Strategic investment in Flora Clinic as Afrox Healthcare acquired the hospital. Acquired land for the Panorama Drive office building JV with Ansel Property Holdings. Peer Review or Peer Support becomes a contracted process assisting both Medical Professionals and Medical Schemes in improving the quality care to our patients. N.H.C brand awareness is achieved through strategic marketing utilizing electronic media, radio, print and radio. There are currently 3 N.H.C Health Centres totaling over 7000 square metres up and running. These centres are all in prime locations e.g. cnr William Nicol and Bryanston drive, Bryanston, cnr Beyers Naude and Waugh Avenue, Northcliff and Cnr Christiaan de Wet Road and Dolfyn Street, Honeydew. The objective now is to open more of these centres, as the recipe has proven sustainable and successful since the opening of the first centre in October 2002. Where doctors approach N.H.C, it is committed to opening new centres. Presently 3 more centres are in various stages of planning and should start opening late 2014 and 2016. Acquisition of Land in Northcliff for Northcliff NHC Health Centre. October: The N.H.C Health Centre in Northcliff opened. Acquisition of Bryanston land for the N.H.C Health Centre Bryanston. May: The N.H.C Health Centre in Bryanston opened. Land acquired in Honeydew for the next N.H.C Health Centre. August: The N.H.C Health Centre in Honeydew opened. N.H.C becomes a founder member of ASAIPA Association of South African Independent Practice Associations amalgamating about 1000 General Practitioners after the untimely collapse of GP Net. N.H.C launches its Radio advertising campaigns on Radio 702 and Highveld 94.7 followed by numerous other stations advertising the N.H.C medical professional network and various aspects of the professionals offering. Acquisition of Shares in Le Rocca office building. N.H.C becomes a founder member of IPAF The I.P.A Foundation of South Africa amalgamating the various different IPA groupings within South Africa creating a larger network of over 3000 General Practitioners Together all IPA’s together to engage with various stakeholders including Medical Aid Schemes and Government. Practice Cash Flow Solutions: Administrative Service was expanded to include medical professionals outside the N.H.C Health Centres. These include specialists e.g. Anesthetists, General Practitioners and Emergency Service and Ambulance Companies. Acquisition of land for the Centurion N.H.C Health Centre. Western Cape IPA affiliate’s with 60 doctors bolstering the number of medical professionals within the N.H.C Medical Professional Network for patients traveling between the Cape and Gauteng. Radio advertising expands to radio stations to cover the new Cape Town Medical Professionals. Tier 1 Consulting created and successfully launched in the recruitment field to test the markets appetite for a different approach to a changing economy. Acquisition of Hurlingham Property for N.H.C office investment. Accelerata Human Capital and Recruitment launched to enhance service offering and invest in new markets. Limpopo IPA affiliates with 110 doctors further expanding the N.H.C Medical Professional Network. N.H.C Health Centre Honeydew gets a power boost as the Photo Voltaic system gets commissioned. Construction starts on the N.H.C Health Centre in Centurion in February. N.H.C takes over La Rocca Investment Management and is mandated to expand its investment portfolio. Le Rocca under N.H.C expands investments by acquiring a tenanted building in Pine Slopes, Waterford Office Park increasing its equity value by just over 30%. New Centurion N.H.C Health Centre opening December 2014 featuring a 120-child nursery school. The N.H.C Medical Professional network achieves over 1000 General Practices under the NHC Brand. Acknowledgement that the medical practitioners within N.H.C need to focus on the treatment of HIV/TB, Top 10 Chronic Diseases and Gender Based Violence, as these are the main burdens facing the country both within the private and public health centre. Electronic Scripting (Health-Soft owned by Bytes Technology Group) and Electronic Pen and Notes (N.H.C Innovative Services) achieve national traction as N.H.C is recognised for innovation in Health Care Administration. N.H.C Head Office relocates to the new premises with training rooms, meeting rooms, canteen and huge open plan offices known as The Box due to its shape! N.H.C Health Centre Bryanston follows Honeydew and gets its Photo Voltaic System from SolarEdge commissioned. Immediately the benefits are seen as the system goes live. New software system rolled out to all N.H.C Health Centres allowing a family or individual one account number no matter which professional a patient goes to see anywhere in South Africa. N.H.C Health Centre in Centurion announces the addition of their 7th General Practitioner. Online Bookings reactivated using the new software platform. PCFS Practice Cash Flow Solutions changes its market approach spreading its administrative services beyond just the private ambulance industry and aggressively into the GP market specifically focusing on the rural areas where both logistics and communications are a challenge. Due to the development of various technologies this is a logical step as these professionals can use the same platforms being used in the N.H.C Health Centres and tap into its hosted service offering. Final Revamp of the Cornerstone Pharmacy Group starts at Northcliff. This means that all branches including Centurion, Honeydew and Bryanston are now completed. N.H.C Health Centre in Northcliff gets commissioned and immediately the benefits are felt as the system produces more than originally calculated. All N.H.C Health Centres are now equipped with Water Tanks and Pressure Pumps to ensure the professionals especially dentistry are able to continue to service their patients.